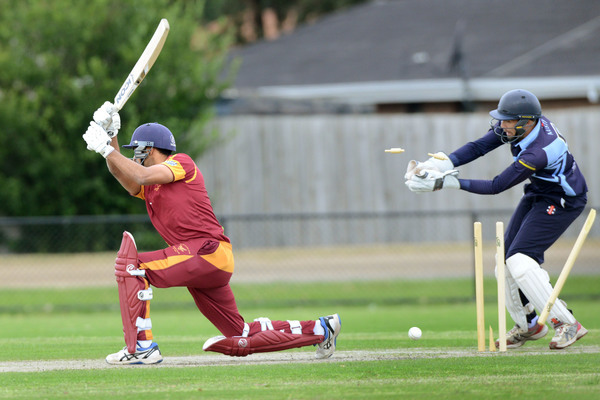 Buckley Ridges has continued its unbeaten start to the Dandenong District Cricket Association Turf 1 season after a clinical chase down of Hallam Kalora Park in Hallam. Batting first in the Round 3 one-dayer, the home side could only muster 8/155 from its 40 overs. Openers Ben Hillard (3) and Leigh Booth (4) both fell early and when Jaime Brohier (3) fell soon after the home side was sitting at a precarious 3/27. The task to set about rescuing the innings then fell on the shoulders of Jordan Hammond (66) and Ryan Hillard (36), who scored over 100 of their side’s runs just between the two of them. But there was only so much they could do, given their side’s shaky start. Buckley Ridges wasted absolutely no time in its reply, reaching 3/160 at the start of just the 25th over with the star opening combination of skipper David White (52) and DJ Watson (79) doing the bulk of the damage between them in their 141-run stand. Saturday marked the first dismissal of the season for South African First Class player White, 27, who has returns of 105 not out, 85 not out, and 52 in his first three hits for Buckley Ridges – all at a whopping average of 242 so far. Berwick, meanwhile, has toppled both of last season’s Turf 1 grand finalists in consecutive rounds. On Saturday the Bears proved too strong for Mordialloc at Ben Kavanagh Reserve. Batting first, the visitors reached a strong 7/214 from their 40 overs thanks to each of their top six batsman passing at least 20 – led by skipper Matt Chasemore with 57. After losing opener Brendan Morris without scoring early in its reply, Mordialloc ultimately reached 8/187 from its 40 overs – led by Damith Mapa Ralalage with 39. Isaiah Jassal was the pick of the Berwick attack, finishing with 3/27 from his eight overs. Mordialloc is now winless through its opening three games of the season. In other DDCA Turf 1 fixtures across the weekend, Springvale South (7/178) was too strong for St Mary’s (163) at Thomas Carroll Reserve, and Heinz Southern Districts (6/209) had the better of North Dandenong (9/194) in a high-scoring clash at Lois Twohig Reserve. HSD star Michael Davis was again simply sensational with both bat and ball, top-scoring with an unbeaten 90 before claiming 4/29 from his eight overs. In Victorian Premier Cricket action at Shepley Oval on Saturday, Dandenong made a brilliant start to the first day of their clash with the Monash Tigers. Winning the toss and batting, the Panthers amassed 8/275 – thanks largely to a 124-run opening stand between club champions skipper Tom Donnell (65) and Brett Forsyth (125 not out). Forsyth is now averaging over 70 so far this season with 352 runs to his name already in just six innings.